This is an example of an offensive foul for charging, with a defender legally positioned outside the Restricted Area. The Restricted Area is the area within the arched line on the court below the rim. To be considered legal and to draw an offensive foul, a secondary defensive player must establish legal position prior to the offensive player starting his upward shooting motion, and the defender must have both feet established outside the Restricted Area line. 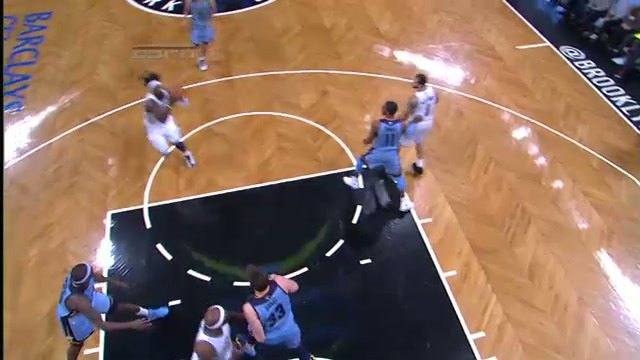 On this transition play, the replays clearly show that the secondary defender did establish legal position prior to the offensive player starting his upward shooting motion, and the defender’s feet are completely outside the Restricted Area, and thus, this is an offensive foul for charging.